Like a just cut wedge of lime in your mouth that bursts with natural goodness till your eyes tear up, NEPA BlogCon is back this year fresh and flavorful. I'm delighted to once again work with 24/7 talent on the planning team along with event co-founders and friends, Mandy Boyle and Michelle Davies, both women with a passion for bringing new ideas and experiences to the Northeastern Pennsylvania community. I believe we are now at the point we anticipate one another's thoughts and well frankly, I think it's kind of what triplets must experience. It's rewarding to be part of such a tight team of sister squirrels and fortunate to have a peripheral support team of terrific sponsors and volunteers for this newish NEPA annual tradition. The past two years were phenomenal with many talented presenters and much uber networking, and we received great community support enabling the event to raise much needed funds for important and deserving area charities. After the first year, when we decided we would make it an annual conference, we also made a pledge that it would never get cookie cutter, deja vu, bland, same old - same old. We want to ensure that attendees come back each year with enthusiasm and curiosity, thirsting for another round (and bring their friends) - always to be guaranteed a fresh, new experience. We've kept our promise! 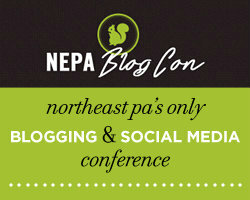 Marking its third consecutive year, NEPA BlogCon, the region's only blogging and social media conference, will be held October 11, 2014. Having received overwhelmingly positive feedback from sold-out audiences in past years, NEPA BlogCon will make its return this fall at Misericordia University, with a new format, many new presenters, and a new cause. NEPA BlogCon is designed to bring together bloggers of all experience levels, as well as those interested in marketing, social media, and communicating through the internet. It's an excellent event for marketers, small business owners, and students, with sessionsÂ focusing on marketing, technology, and blogging for business. The conference will include beginner and advanced sessions on topics including social media in sports marketing, finding your photographer's voice, using Facebook to grow your business, blog monetization, brand building, and getting started with YouTube. Featured speakers include Brian Coe of the Wilkes-Barre/Scranton Penguins, Frances Croke Page of the PureFoodsProject, Danielle Fleming of NOTE Fragrances, Him Cheney of Uncovering PA, and internationally-acclaimed blogger and non-profit founder, Shane Burcaw of Laughing at My Nightmare. Last year, NEPA BlogCon drew more than 125 local bloggers, technology influencers, students, and marketing professionals to Northeastern Pennsylvania, raising thousands of dollars to benefit Blue Chip Farms Animal Refuge. Since the event originated in 2012, the amount raised for charity totals more than $5000. All proceeds from this year's conference will be applied to STEM education through the launch of a regional code camp in summer 2015, for girls in fourth through sixth grades. Like NEPA BlogCon, the code camp will be held in collaboration with sponsor organization, TecBRIDGE, a regional collegial organization that collaboratively strives to create and embrace entrepreneurial opportunities with the purpose of growing technology and biotechnology wealth within Northeastern Pennsylvania. Attendees look forward to the annual NEPA Blog of the Year (BOTY) Awards Competition leading up to the conference. Each week, blogs from selected categories will be nominated and voting will be opened for fans to vote for their favorite bloggers on a poll on the conference website blog at NEPABlogCon.com. Winners in each of the following categories will receive a commemorative award certificate and additional prizes at the conference; Political Blog of the Year, Fashion/Lifestyle Blog of the Year, Food Blog of the Year, Fitness/Sports Blog of the Year, and Writing/Business Blog of the Year. Tickets are available for $15 and registration is open at nepablogcon.com. Once again, this year's official media partner for NEPA BlogCon is WNEP-TV 16. Sponsorship opportunities for businesses and community organizations are still available. Visit nepablogcon.com for details. Saturday, October 11 from 9:45 a.m. to 4:00 p.m.; registration opens at 9:00 a.m. Does liking a page on Facebook equal endorsing it?